I completely forgot to post it in my blog. I actually read this from PEP (Philippine Entertainment Portal) last Monday where they confirmed that Taylor Swift concert is set on February 19 in Araneta Coliseum. 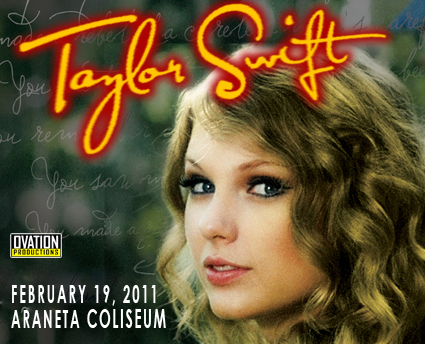 The concert is part of Taylor Swift's Southeast Asian Tour for her album, Speak Now. Selling tickets to the public started last November 8 in Ticketnet Outlets. For those interested to buy (like me) , call 911-5555) or go online at www.ticketnet.com.ph. I'll probably ask my youngest sister to join me in watching the concert since she likes this gal so much and I need company. My husband will obviously not go since he's not a big fan of TS.